"I know that time is ticking toward twelve. But perhaps our day will dawn again. Maybe this graphic novel thing has some legs." There are some works which demonstrate their grand majesty, their epic qualities, immediately on their first page; you just know you've struck gold as soon as you begin reading. And then there are those works which go quietly about their business, building their story, drawing you in little by little, encompassing your imagination further and further, until almost without realising it, you're completely immersed in a marvellous and splendid world, on a journey that you never want to come to an end, and when you finish the final page and close the book, you're already a little wistful for what you've just left behind. 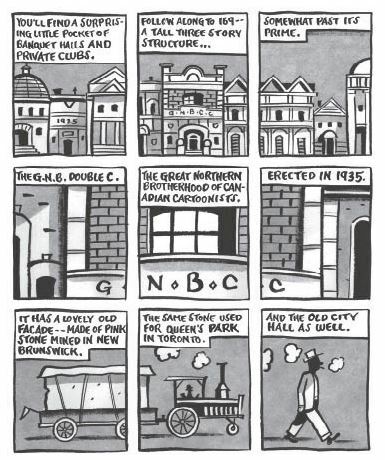 This latest work from Seth is a classic example of the latter, though it actually almost never saw the light of day at all, as in its original incarnation in his sketchbooks, it started off as more of an essay on early Canadian cartoonists, and frustratingly for the author, wasn't really progressing in the way he'd hoped. So instead he concentrated on the hilarious story of the world's greatest comic collector, WIMBLEDON GREEN, and was apparently only convinced to return to this work after friends who'd seen the roughs convinced him there was a classic of a story waiting to told, and so he set to work. The first thing he did was completely revise his vision, and in fact ended up redrawing most of it, incorporating many fictional elements, to produce this finished work. 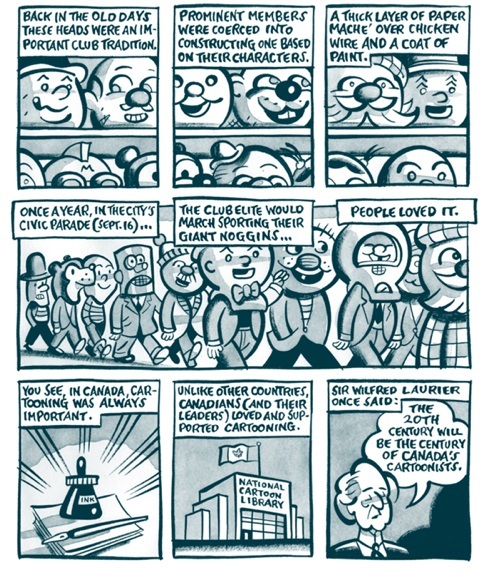 So what exactly is the Great Northern Brotherhood of Canadian Cartoonists? Ostensibly it's a story told on two levels, an actual tour of the headquarters of the said club of luminaries by Seth himself, wandering round the various lounges, halls, corridors and studios, (several of which provide an art deco statement la Société des Artistes Décorateurs would have been proud of) whilst he narrates the great history of the club and regales us with examples of many of its famous members' most outstanding and noted works, thus providing an elaborate illustrated history of the 20th Century's most celebrated Canadian cartoonists. Except, of course, most of these people never existed and these stories were never told! 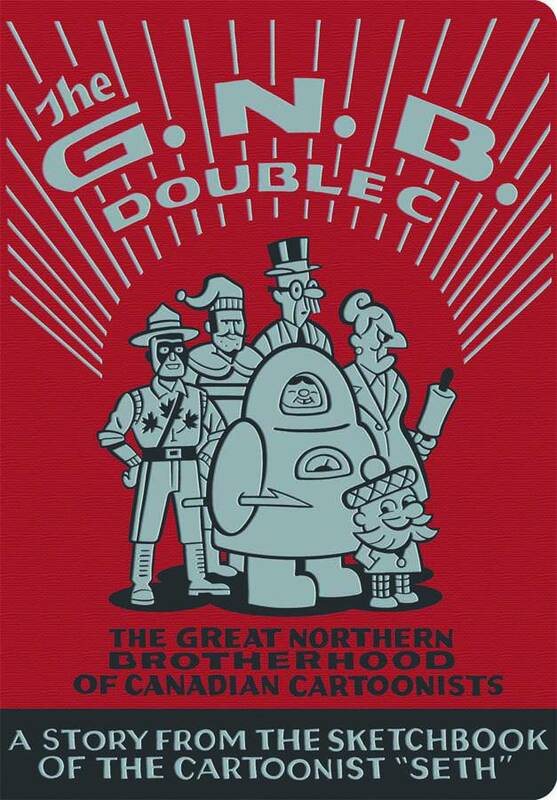 For sure there are some nods to real-life greats like Doug Wright worked in there, clearly someone Seth has a lot of affection for, but on the whole it's fictional stories about Eskimo astronauts, generational period dramas and flying ghostly canoes that capture the imagination. There are many, many tantalising tidbits of such stories shown to us, which I'd dearly love Seth to go back and expand on at some point, as they contain such wonderful ideas it seems a shame not to explore them further. Even though Seth shows us a myriad of these creators throughout this book, the art style remains his own throughout, with only the most minor stylistic modifications employed to illustrate the many creators' works. It's a conceit that works extremely well actually, because otherwise it undoubtedly would lose the coherency that pins this work together, the sense of seamless progression through the ages as we wander deeper and deeper into the club itself, finally culminating in an appropriately wistful little rumination from Seth himself, quoted above, as he enjoys a quiet cigarette on the roof overlooking the city skyline. 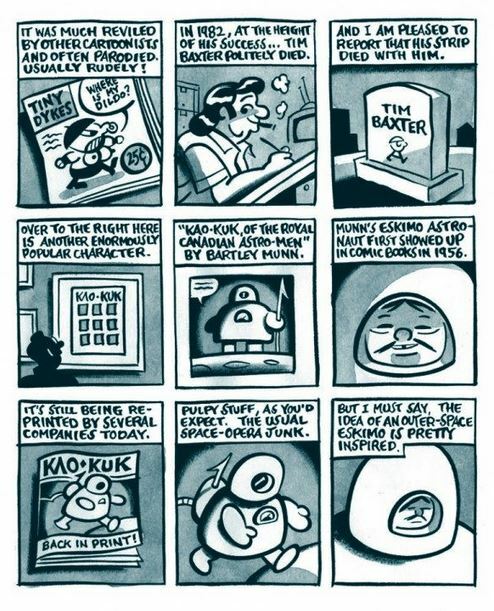 And if people can keep producing graphic novels as outstanding as this work, I don't think we or Seth need worry about our beloved medium for a long, long time to come.